Lightweight, responsiveness, and sensitivity will be what anglers experience in Shimano’s new Poison Adrena bass rods, being introduced this week at the Bassmaster Classic Outdoor Expo in Knoxville, Tenn., and soon to be available from select tackle dealers throughout the U.S. and Canada. 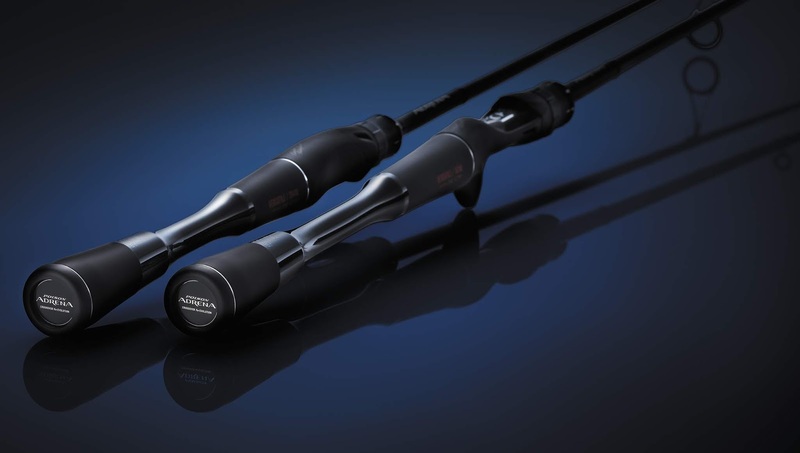 Featuring Shimano’s proprietary Spiral X Core blank construction, the series includes four rods – three casting and one spinning – offered in the lengths, actions and powers for the primary techniques used most by avid, tournament-level bass anglers. Further contributing to overall light rod weight, the Poison Adrena’s hollow structure ‘Full Carbon Monocoque’ grip end design uses super lightweight carbon construction “to greatly increase sensitivity – you’ll be able to feel the vibration of your lure going through the water from the tip of the rod to your hand,” Epich notes. “You’ll feel the smallest bites from that sensitivity, and then it’s up to you to set the hook – the power is there to drive it in. Also keeping rod weight down while maintaining maximum strength is the use of Shimano’s CI4+ material in the reel seat. The Poison Adrena line-up includes 6’11’ M+, 7’2” H and 7’3” MH casting – all with versatile actions to cover a myriad of techniques, and a 6’7” ML spinning rod, which can pull duty for dropshot, Ned rig or Neko rig situations.